So begins the turbulent ride of one parent’s decision, crafted in despair and desperation, to abandon traditional interventions for her autistic son in favor of a “hands on” approach of repeatedly exposing her son to real-world settings. Autism Uncensored is an unrestricted portal into the mind of someone who had no intention of sacrificing her career or life for Autism, unaware of the many ways it would irreversibly redefine both. As she clarifies at the outset, “this is not the story of a miraculous breakthrough or recovery,” Zack is still very much autistic and always will be. It is instead the true, real-time account of her decision to allow Zack to indulge in the very behaviors that formal therapies sought to extinguish, to disclose Zack’s diagnosis in public settings, and to repeatedly expose him to real-world situations and override his tantrums regardless of public ridicule or scorn. Autism Uncensored goes where no other book dares ~ revealing the private disgrace and self-blame about having a “defective” child; the near disintegration of marriage; the failure of the traditional behavioral interventions; and the mercenary way in which service providers prey on parents’ desperation for a cure. It is a personal manifesto about how a socially integrated life is attainable regardless of whether a child overcomes the major limitations of Autism, sparking a new conversation which goes beyond simply accepting persons with Autism for who they are, but considers pushing them beyond their comfort zones to learn who they are capable of becoming. 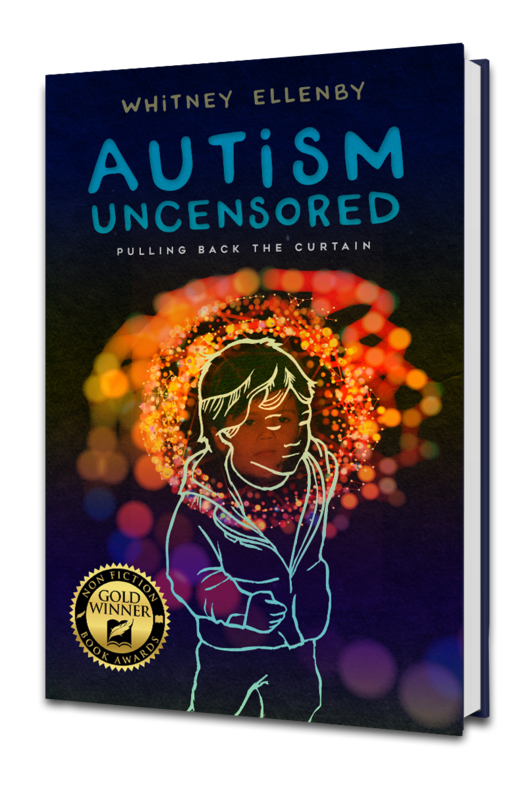 An unstoppable ride with jolting twists and turns, Autism Uncensored will leave you exhilarated, informed and still gasping for air. "A spellbinding achievement. Startlingly lucid, magnificently honest, and written with a magic golden pen, this book is an act of personal deliverance, spiritual redemption and heroic citizenship. It will make you weep for the people inside of it but cheer for all humanity. The irrepressible Whitney Ellenby shows us that, even in our darkest hours, all is not lost, we can find a way to a personal light." Congressman Jamie Raskin, 6th District, Maryland; Professor of Constitutional Law, American University, and Best-selling Author of, We the Students and Overruling Democracy: the Supreme Court vs. the American People. "Autism Uncensored is an unflinching exploration of a mother's emotional--and, at times, physical--struggle for the dignity and humanity of her autistic son. A brave book." Ron Suskind, Pulitzer-prize winning journalist and best-selling Author of Life, Animated: A Story of Sidekicks, Heroes, and Autism (2014). Bill Turque, former journalist for The Washington Post and Author of Inventing Al Gore. “Reading the story of Whitney and Zack is so real that I could visualize, feel, and smell the struggles, joys and emotions of their journey. I have worked with families and individuals with Autism Spectrum Disorder for over 30 years and never have I experienced the intimate depth of knowing what it takes to raise a child with Autism. The writing exposes a parent’s vulnerability so that others can better learn and understand the true meaning of unconditional love and acceptance. This book is alive!" Donna Meyer, First Grade Teacher, Bethesda Elementary School. Steven Osherow, Therapist and friend of Zack. Whitney Ellenby is a former US Department of Justice, Disability Rights attorney and proud parent of a son with Autism. She is the founder of “Autism Ambassadors,” a charitable venture which provides recreational events for over 600 families in Maryland and surrounding areas, including a Sensory-Friendly showing of the world-famous “Gazillion Bubbles Show.” She and her “Ambassador events” have been featured in local t.v. news, the Washington Post, the Bethesda Gazette and Bethesda Magazine.